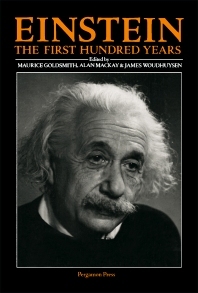 Einstein: The First Hundred Years presents the great contribution of Albert Einstein to the development of science. This book discusses the significant role of Einstein's existence as a scientist who turned out to be a great public figure that changed the society's consciousness of science for good. Organized into five parts encompassing 17 chapters, this book begins with an overview of Albert Einstein's achievement as the greatest theoretical physicist of his age and he was universally recognized at 37. This text then provides Einstein's major contribution to the special and general theories of relativity. Other chapters consider Einstein's work on the development of quantum theory for which he received the Nobel Prize in 1921. This book discusses as well Brownian movement and statistical theories by Einstein. The final chapter deals with the increasing widespread interest in Einstein's work. This book is a valuable resource for scientists, physicists, teachers, and students.